- You can open and close card like a real. - Orthogonal 3D perspective and attractive sound fx. - Music mute and fullscreen mode buttons. - Easy to use, you can change logo, music file and text block without recompile original .FLA file. - Fully vectorized and can be resized. - Version without XML also included in archive, just all-in-one-file animation.- 25 fps. Enjoy, and donâ€™t forget to rate it! 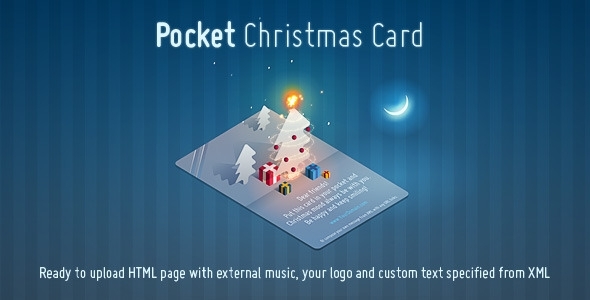 Complete, animated and sounded Christmas card with particles (snow, sparkle) effects. HTML page template with XML custom external logo, music and adjustable multiline textblock with tags and URL link support. Animation centered in browser window. You can open or close card like a real. Do you have any comment or questions about ehabalfred file?